Whether this got Leonid out of bed earlier than usual is not sure, but in any case we were filming the short interviews with Steve and Graham by around 10:30. Afterwards we filmed the video below where one can clearly see how the mechanically weakened Biotensegrity Tower obtains a much improved tensional uniformity when an ABR Wrap is added in a clever manner. We hope you enjoy seeing this demonstration that illustrates how an ABR Biotensegrity Applied Wrap can help to reinstate tensional uniformity in children and adults whose structures have weakened, are sinking, folding or buckling – just as Steve’s Model made by Bruce Hamilton does when one loosens the tension slightly. This improved tensional uniformity then leads to improvements at the level of the body to which it is applied as well as having a global effect. We will write more about this in another post! In addition the video gives a small taste of the coming Christmas Holiday! As I wrote this week in my last post: There Is So Much to Tell About! The Autumn and pre-Winter seasons have been amazingly full for our Denmark Team. We have been working, learning and finding new persons to be inspired by! Then again – the children and families themselves are a source of constant inspiration to whom we are most grateful for their devotion and diligence with the ABR work. Without ABR parents who do ABR at home most every day, there would be no ABR and no ABR development at all! It is your “home work” that shows us how to go further, how to change how to improve. But now to the titled post theme: “Biotensegrity”. What is Biotensegrity and how does it relate to you as a parent of a child with developmental difficulties or to any person with a handicap himself? Biotensegrity is a word first coined by Dr. Steve Levin. Steve Levin was an orthopaedic surgeon, who became inspired by Buckminster Fullers ideas of tensegrity and who then realized that one could apply the concepts and thoughts developed by Fuller to living organisms. Thus the term: Bio-tensegrity. Those who have been following my blog will have read the chapter written for Dr. rer. nat., Dipl. phys. Danièle-Claude Martin’s book called “Living Bio-tensegrity”. (https://abr-denmark.blog/2017/01/03/bio-tensegrity/) This book illustrates the many concepts inherent to Biotensegrity. Daniele could see that these concepts and ides that she strives to describe in her book were being applied in practice in the ABR work. When writing her book she asked for a chapter about ABR so that the readers could see how Biotensegrity can look in practical application. Dr. Steve Levin and Dr. Danièle Martin initiated a Biotensegrity Interest Group already nine years ago. This group met again for the IX BIG meeting in October and the members shared and discussed concepts related to Biotensegrity and how they relate to the new and emerging science about fascia and connective tissues. This is a very exciting meeting to take part in and this year again Leonid Blyum made a presentation about larger questions having to do with the Biotensegrity model. I took the opportunity to present our practical work in the field with ABR. A day before the actual conference started however I could meet with Steve Levin and Graham Scarr. Graham is also extremely active in the field and has a book out about Biotensegrity as well. They were looking at a Tensegrity Mast that Steve had with him and as soon as I saw it I became very excited because I could see that the model would illustrate exactly to the point what we see in children and adults with cerebral palsy and related handicaps! In this sense the presentation fit perfectly with the illustration that one could get from Steve’s new Mast Model. If one loosens one strut, the entire model is weakened. If one tightens up one strut, the entire model re-gains its tensional uniformity. It is this uniformity and tensional integrity that children with special needs are lacking. Their bodies react with sinking, bulging, folding and buckling under. These severely effected individuals perfectly illustrate the biotensegrity concepts in their structure, their attempts to move and even in their “behavior”! When the structure is architecturally unsound and reacts with buckling, sinking and folding – then no amount of brain or of muscle training can rectify this. The muscles and the brain are rather forced to try to find ways of working within the constraints of a seriously weakened structure. His interesting usage of his hands for stability to be able to manage the weaknesses is very inventive and creative indeed. ABR Techniques are all about restoring structural soundess and uniform reactions for individuals who have lost this or who have never had it. The Biotensegrity models are firing and inspiring our technique development and have been doing so for years. Below are some slides from the presentation of our children and their progress. First some younger children. Now an older guy – a GMFCS Level V young man (although he is moving up in his GMFM scores) – who is now 20. He is much older and far beyond an age or GMFCS Level where any improvement would be expected at all – only further deterioration. It is great to see how this young man is improving day by day! Our next post will be about Leonid Blyum and how he “heals” Steve Levin’s tensegrity tower with ABR wraps . And also how ABR wraps get a new name! The Last ABR Assessment in 2017 – So much to tell! The last months have been extremely full for our team, and there is so much to write about, but before I start to add all the half written posts that are waiting to be published, our last story of the season must be told. This evening when we were ready to hold the last ABR Assessment for 2017 the Team was very tired after many weeks of holding courses back to back – and in no case were we ready for such an amazing surprise. 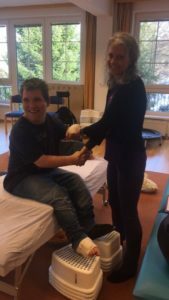 A 25 year old young man from Austria named Christian and who started with ABR in March 2017 drove his wheel chair through the door to our seminar room in Reichenau a. d. Rax. We knew Christian as a generally very fused and stiff young man with only minimal independent movements and bodily mobility. He can drive his own wheel chair by employing a joystick and can talk, but it was very difficult to understand him. He is however a very engaged young person and works in an organisation that promotes the interests of handicapped people in Austria. When he entered the room, it was clear that an enormous development had occurred. One could see that his face was much more relaxed and his eyes sparkled with excitement. – Hand usage – he now stretches ou this arm and grasps the hand when he “shakes” hands – not only offering a stiff unmoveable hand at a close range to his body. – He opens bottles alone and can drink from a bottle. – There is a very difficult clasp that he has learnt how to open. – At work, he sets the table. – At his workplace, they often give him more complex tasks to do on his own. – He can use the ATM machine for getting cash on his own. – He is extremely motivated and now wants to do everything himself. Refuses help even when it takes much longer to do things his way! – Takes off his jacket and can put it on. More independence when dressing. – Has learned to open and close zippers. – Shaves, washes and brushes his teeth alone. – He figured out himself how to propel his wheel chair alone manually – not using the joystick. Then he figured out how to use his upper body and not only the arms alone so that each push propels him much further along. 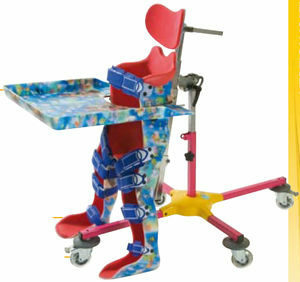 – He can now walk with his walker without assistance – slowly albeit but never the less! – It is much easier for him to read. – His speech is not only much clearer and easy to understand, but he uses more words and composes more complex sentences. – His facial mimics expression has expanded and blossomed. – He can now lie relaxed on his front – it was not possible for him to be on his front before due to stiffness. – Put all fingers together in front of his body. – Fold the hands together easily. – He can sit on his own without support. – He can play with a ball and do other activities when sitting freely. And a big hug with Johannes was also possible! – Divisions within his thorax allowing for a huge improvement in the respiration. 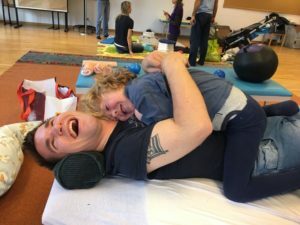 The parents commented that before they started with ABR, he had not improved in any function in years and that it is also the expectation for severe young people with cerebral palsy like himself, that he would simply get worse with age and time. They are also very surprised how much he has changed. This does not mean that there is not a great deal that can still be achieved or needs to be worked on with ABR Applications, but it is wonderful to see that a 25 year old young man with a level IV Cerebral Palsy can make such fantastic improvements in the ABR program in such a short time span. Thank you Christian for letting us share your story! Those of you Dear Readers who have been applying ABR Techniques with your children or your own selves for many months or years, may from time to time have to explain the variety of ABR Techniques to other family members, friends or visitors. Not everyone can immediately find the words to be able to introduce others to the meaningfulness of the unique ABR work. The newest Power Wraps, which we at ABR Denmark have been eagerly experimenting with for the last few years for example, could pose a certain difficulty in explanation. Although this need not be the case, when today the Internet is full of the most amazing images of women who wrap themselves from head to toe as if they were preparing for a Living Egyptian Ceremonial Mummification! No one seems to find anything strange about these rather odd looking techniques because one silently accepts that a woman would do anything when chasing youthfulness or beauty – and the “Before and After” photos of results achieved are surely very convincing! These type of beauty and wellness wraps are gaining in high acclaim and women and men alike are prepared to spend anywhere from 200 to 400 Euro and upwards to have their body remodelled through these weight-loss, cellulite diminishing, wrinkle erasing wrapping techniques. One hour of sweating with a wrap and clay, coconut oil or other substances and your body could be reborn! – Yes, only one hour of sweating with wraps. Should it be surprising? Body wrapping in various forms is a civilisation old technique. One of the most well known and – equally well-forgotten being the “baby swaddling”. Baby swaddling was done through out the world by rich and poor in the so called “primitive” and civilised peoples alike – until that moment when the microscope-based medicine took over in the Western World. Any reason for swaddling a baby could not be found under a microscope or in any of the other more sophisticated diagnostic tools being used today such as MRI’s, CAT Scanning, blood tests, tissue biopsy’s, gene analysis, etc. All of these modern forms of diagnosis can show nothing about the importance of baby swaddling! The same will of course be true for an ABR based Power Wrap. We will talk about baby swaddling in a future post, but what is important about our present ABR wraps? None of these responses are however representative of the healthy individual. The healthy individual has a uniform response to loads coming from without – a response that could be called an internal “Bio-Tensegral” response to external motion or loading. CP Child: Non-Uniform Response – buckling, sinking, chest and abdominal fold – all as a response to the loads of the child’s own body. Healthy Child: Uniform Response – Even extra loads from the top do not cause any sinking, twisting or buckling under. The CP child however exhibits all of these: sinking, folding, buckling under and twisting. 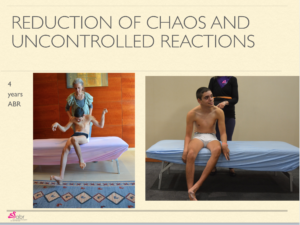 This is a part and parcel of the life of a CP child in respect to his own body and own body experience and reactions. The “own body experience” is more popularly termed our “proprioception”. This is the word used for ones internal body perception with respect to movement and spatial arrangement. What do we have as organs of our movement perception? We have “receptors” – and these receptors are anchored within our tendon/muscle system. These are all the so-called “stretch-receptors” meaning that they are dependent upon tissues in our body coming into tension or being stretched. The tissue that is lengthened and brought into tension is normally a tendon. When the tendons are stretched through movement, then the neurons fire and send information back to our central nervous system. But on the other hand, if there is no tension – if the body reacts through bulging, sinking and buckling under –then this means that there is a severe loss of information returning from the body to the central nervous system. Non-uniformity of response means that the area of the body is excluded from the body map and cannot perform any proprioceptive feedback. What does an ABR Power Wrap do? It seriously reduces all of the above-described non-uniform reactions to loads coming to the body or to the body area. One does not re-position the foot when wrapping, but a well-performed wrap of the foot provides uniformity of response to the area being wrapped. A well-performed wrap of the hand provides tensional uniformity to an excluded hand with the typical horizontal fold or derailed wrist. This tensional uniformity then ensures that the area begins to return the bodies proprioceptive system. In addition the wrap serves to “re-connect” the “dis-connected” areas to more stable body areas. Tensional uniformity and uniformity of response means that the excluded area can be re- integrated into the proprioceptive organisation of the body. The list of improvements being seen with the Power Wrap usage is long! Above is only a partial list. The biggest impediment is of course the time needed to put a wrap on. 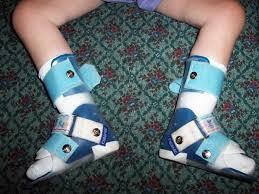 We show photos below of the foot to leg development of a child who used the wraps for a few months. During the time period, we were employing a much simpler and less effective wrap in compared to our new wraps set-ups – and still one could see the fantastic effects! November 2014 – The girl’s feet do not take any weight. There is no load transfer through the feet. June 2016 – By this time the girl eagerly takes the weight on her feet. Of course the improvements in trunk stability and head control were not coming from any of the simple foot wraps that we were using at that time – this came through other ABR Techniques – but the fact that she eagerly takes the weight on the feet – that the feet react spontaneously to the body loads – this was wrap work. 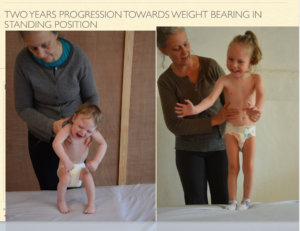 In spite of the time needed to put on the newest version of the wraps, the benefits now being seen are so obvious, that we can only encourage our parents to use the Power Wraps as much as possible. Wear them during the day, at school, when sleeping – whenever it will work. Yes, I know: if one puts them on for the school day, then one may need to answer questions from the teachers! Or see the raised eyebrows when one brings the child. It is only a matter of time until the newest ABR based “CP Fashion” hits the world. Be brave and add these wraps to your child’s wardrobe and selected outfits. The benefits clearly outweigh the funny looks one might get. And remember: When the area of the body being wrapped achieves a higher level of tensional uniformity, it returns to the body map. In addition the tensional uniformity of the area is the signal needed for those famous myo-fibroblasts to come out of the hibernation they go into when the tension is not present. They then begin to wake up and work hard on the tissue remodelling work! It is only a matter of time until the remodelling takes place allowing for improved structural integration. “As Good As Being Yours”! 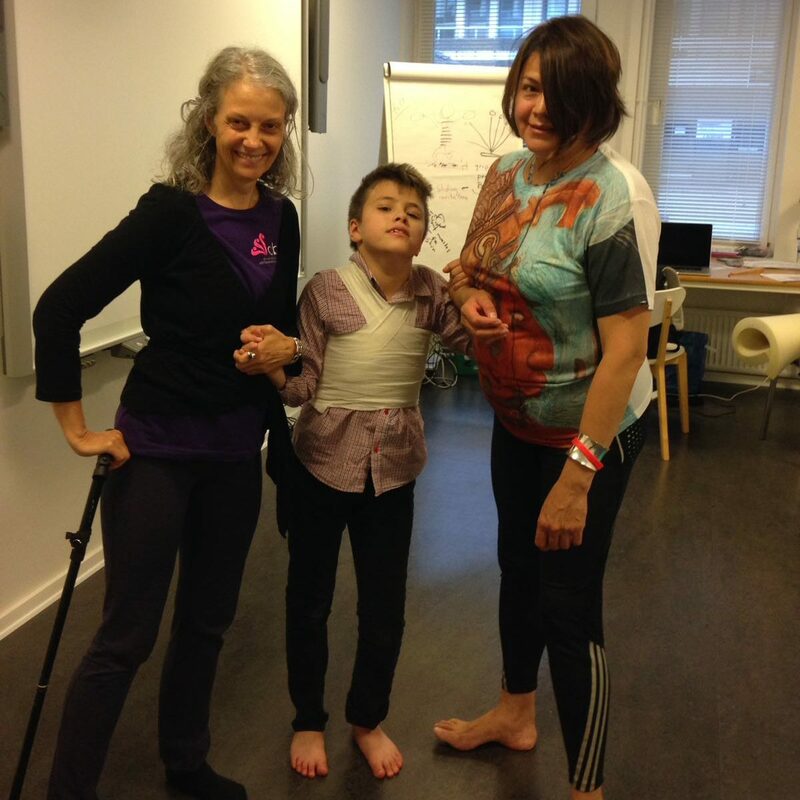 On this Blog you find writings by Diane Vincentz, the Director of ABR Denmark, with inspiration on all matters related to her work in the field of complex movement therapy.